If it’s Tuesday, it must mean the Washington Capitals are playing. 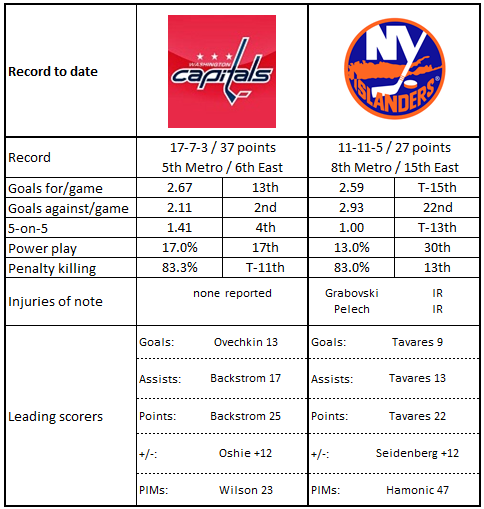 Since the first of December, the Caps have played a game every other day, like clockwork, and the pattern continues on Tuesday night when they head to Brooklyn to face the New York Islanders. The Caps, in the midst of a four-game winning streak, are 4-2-1 in December and take a 6-3-3 road record into the contest. Their win in Buffalo last Friday night against the Sabres broke a four game losing streak away from Verizon Center (0-2-2). The Islanders come into this contest with a nice record of their own over the past couple of weeks. After going 6-10-4 over their first 20 games, New York is 5-1-1 over their last seven contests, including a 3-0 white-washing of the Caps on December 1st. Those seven games have been, by current standards, almost fire wagon affairs, the Islanders averaging 3.24 goals per game and giving up 2.57 goals per game. Special teams have run hot (penalty kill: 95.0 percent) and cold (power play: 10.5 percent) over that same span of contests. If, over those seven games, you thought John Tavares would be the leading goal scorer and point getter, you would be right (4-3-7), but right there with him in goal scoring is Anders Lee (4-2-6). After a slow start in which he recorded only one goal in his first 18 games of the season, Lee has seven goals over his last nine contests. Two of those goals came on power plays, and he has two game-winning goals in that collection. If there is an odd things about the eight goals that Lee has scored overall, it is that they are not a regular accompaniment to Islander wins. New York is just 2-3-1 in the six games in which Lee recorded a goal this season. In 11 career games against Washington, Lee is 4-1-5, plus-1. Another name that shows up among the goal scoring leaders for the Islanders in this recent run is Jason Chimera. He is another Islander shaking off a sluggish start. After posting just one goal in his first 21 games this season, he scored goals in three of four games, including a goal against the Caps in the 3-0 win on December 1st. Unlike Lee, however, all four of Chimera’s goals have come in Islander wins. Perhaps fortunately for the Caps, he is without a point in his last two games. He is 2-2-4, plus-3, in seven career games against the Caps. Jaroslav Halak might have reclaimed his spot as the Islanders’ number one goaltender for the time being, but he is still searching for some consistency. Halak, who has alternated wins and losses in his last five appearances, has yet to win consecutive decisions this season. He does, however, have a four-game and a five-game losing streak on his record. Only six times in 18 appearances this season has he allowed fewer than three goals, and he was lit up for six goals on 38 shots in his last appearance, a 6-2 loss to the Columbus Blue Jackets last Saturday, when he was finally relieved with a little over five minutes left in the contest in favor of Jean-Francois Berube. Halak is 7-6-0, 2.51, .908, with one shutout in his career against the Caps, the shutout coming in the 3-0 win on December 1st. --The Islanders certainly have enjoyed a lot of home cooking in the first third of their season. Of the 27 games played so far, the Isles have skated 17 of them on home ice. -- Not that home cooking has helped the Islanders in one respect. Their home power play (10.9 percent) is dead last in the league. And while their penalty kill is respectable (83.0 percent), only three teams have been shorthanded more times on home ice than the Islanders (53 times) – the Winnipeg Jets (54 times), the St. Louis Blues, and the Montreal Canadiens (60 times apiece). -- The Islanders are the only team in the league that has yet to win a game when trailing at the first intermission and when trailing at the second intermission of games. If the Isles trail at either, they lose, or so their history this season has unfolded. -- And, if you outshoot the Islanders, chance are you will win. Only the Los Angeles Kings have fewer wins when outshot by opponents (three) than the Islanders (four). -- The Islanders are a possession-challenged team on home ice. They rank 28th in the league in Corsi-for at 5-on-5 (46.86 percent; numbers from Corsica.hockey), the worst number in the Eastern Conference. -- The Capitals will be looking for their fifth straight win, which would tie them with their season-best, a five-game winning streak in Games 7-11. -- The Caps are 10-for-46 on the power play in their last 12 games (21.7 percent). This could be a good sign; the Caps are 10-1-1 in the 12 games in which they scored a power play goal this season. -- On the other hand, the penalty kill has seen some cracks. It is 31-for-38 (81.6 percent ) over the last ten games. Washington is 10-2-1 this season when shutting out opponents on their power play. -- Washington has not lost a game this season when scoring more than two goals. They are 15-0-0 in those games. Conversely, they have not lost a game in regulation when allowing two or fewer goals (not counting Gimmick goals), posting a record of 14-0-3 in those games. First to three wins. -- The Caps rank eighth in the league in Corsi-for at 5-on-5 in road games (51.98 percent; numbers form Corsica.hockey). Take the blocked shots out, and things are different. Washington ranks 14th in Fenwick-for at fives (49.94 percent). Josh Bailey is one of those players who isn’t going to get a basket full of accolades, but he is a consistent and dependable player. In six career seasons in which he appeared in at least 70 games, he failed to reach the 30-point mark once (28 points in 70 games in 2010-2011). He doesn’t really shoot that much (1.48 shots per game in his career), but he has a respectable 11.3 percent career shooting percentage, although he is somewhat below that so far this season (9.3 percent). He has been productive of late, going 2-4-6 in the Islanders’ recent 5-1-1 run. If he scored more, he might be in the running for the Lady Byng Trophy. Bailey has just two penalty minutes in 27 games and more than 500 minutes of ice time this season. He has not taken a penalty minute on home ice in 24 contests dating back to last season and has just two penalty minutes in his last 43 home games. Bailey is 4-8-12, minus-8, in 33 career games against Washington. Remember when Brooks Orpik was one of the big boppers among defensemen? Well, this season he seems to be taking on, if not a more sedate role, then one of overseer of the defensive end as his partner – Dmitry Orlov, Nate Schmidt, or someone else – jumps up into the play. Among defensemen appearing in at least 15 games, Orpik ranks just 25th in hits per game. Some of that is, no doubt, a product of the Caps’ good possession numbers, but it might reflect something of a changing role, too. On the other side, Orpik does not have a goal yet, which is not unusual given his history, but he is on pace to finish with 18 assists, which would be within striking distance of his best total as a Capital (19 assists in 2014-2015) and the second highest total of his career (he had 23 helpers in 2009-2010). Orpik is 3-11-14, plus-6, in 67 career games against the Islanders. The goals, assists, and points are the most Orpik has against any opponent in his career. The Islanders are hardly a pushover at the moment, but the Capitals should have motivation for the way they were handled by the Islanders on home ice not two weeks ago. One would think returning the favor would be on their minds. As was the case in that game, the Caps will face a team with a very uncertain and unsettled goaltending situation. It did not stop Jaroslav Halak from posting a shutout, and it goes to show that there are no gimmies in the NHL. If the Caps want to keep pace with a Metropolitan Division that is showing itself to be the strongest division in the league, they will have to do far more “taking” than “giving” to make up for that disappointing performance on December 1st.